1. Self-healing: dielectric adopts metallized polypropylene as in-between material; in case excessive voltage takes place and damages the in-between material, the metallized film around the damaged spot will disappear instantly, and insulation is restored immediately. 2. High safety control: in case of abnormal situation happened either on line or on capacitor itself, the built in protective device will act and cut off the power supply automatically, hence avoid the relative disaster. 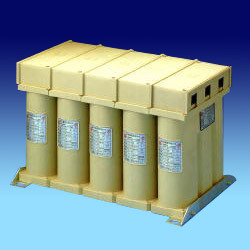 The outer box is made by noncombustible plastic projection, conforming UL 94V-O standard. 3. Minimum size, light weight and easy installation. 4. Low loss, low temperature, longer service life. 5. Flexible capacity as demand by free assembly or dismantling. 1. Standards: CNS 1179, 3738, JIS C4901, IEC 831. 4. Maximum working voltage: below 110% of rated voltage. (Below 8hrs during 24 hrs). 6. Dissipation factor: below 0.15%. 7. Discharge character: the residual voltage drops down below 50v in 1 minutes of the capacitor being disconnected form the power source. 8. Protect character: self-healing mechanism and built-in protective device.